Trillions of healthy bacteria live in your digestive tract, where they help break down food and play an important role in keeping your gastrointestinal tract functioning normally. If your doctor prescribes antibiotics to clear up a bacterial infection, they'll likely kill the bacteria that make you sick, but might also destroy your beneficial intestinal bacteria, causing diarrhea or other uncomfortable tummy troubles. Fortunately, there are ways to replace your body's good bacteria after taking antibiotics. Antibiotics can upset the natural balance of microorganisms living in your GI tract, sometimes causing diarrhea. According to Harvard Medical School, about 1 in 3 people who take antibiotics experience diarrhea. Probiotics are live, healthy bacteria and other microorganisms that help repopulate the microbes in your intestines. A May 2012 study published in the "Journal of the American Medical Association" found that taking probiotics can reduce antibiotic-associated diarrhea. Yogurt is a good food source of probiotics. When choosing a yogurt to help replace healthy bacteria, check the label to be sure it contains live and active cultures. If you prefer to drink your probiotics, try kefir, a creamy, tangy, dairy-based drink that's made when healthy bacteria, mostly lactobacteria and streptococci, and yeast are introduced into milk. 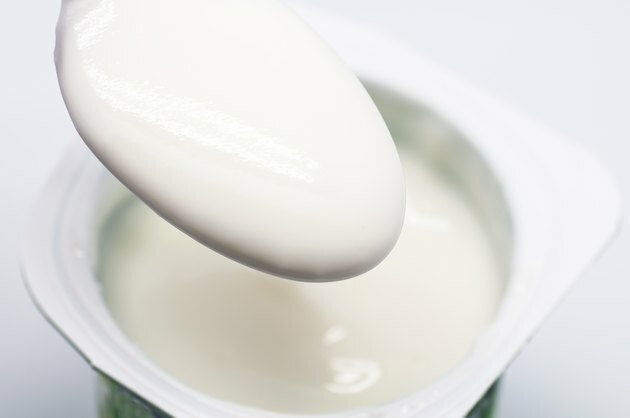 The fermented product is similar in taste to yogurt, except that it's a liquid. According to the National Kefir Association, it contains seven to 10 probiotic cultures, even more than most yogurts. Kefir is available in the dairy section of most grocery stores, and you can drink it plain or use it as a base for a smoothie if you blend it with fruit. If you're on a diary-free diet, try foods such as kimchi or sauerkraut. Both are made from fermented cabbage and contain probiotics. Purchase them fresh from the refrigerator section, rather than canned or jarred versions which are heated or pasteurized, because high heat destroys probiotics. You can also drink kombucha tea, a probiotic-rich beverage that's available as a fresh product from many natural food stores. It's a sweet-tart and fizzy tea that gets its probiotics from the fermentation of sugar by bacteria and yeast. Sometimes it's difficult to be consistent about eating probiotic-rich foods, or you may want a more concentrated source, so you can also take a probiotic supplement. According to the University of Maryland Alternative Medicine Guide, Lactobacillus acidophilus is the most commonly used probiotic, and it's available in capsules, liquid or powders. Follow the dosing instructions on the label and refrigerate the supplement to maintain its quality. If you're experiencing any side effects from antibiotics, including diarrhea, check with your health care provider for the best course of action. National Kefir Association: What is Kefir?